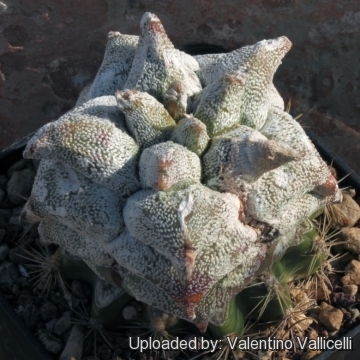 Origin and Habitat: The Astrophytum coahuilense cv. Hakuran was produced in 1981 by Mr. Narita from Aichi Prefecture, Japan. Astrophytum coahuilense f. monstruosa hort. Kakteen-Freunde i. 59. (1932); cf. Gray Herb. Card Cat., Issue 143. Astrophytum coahuilense f. cristatum hort. Astrophytum coahuilense f. tricostatum hort. Astrophytum coahuilense f. caespitosa hort. 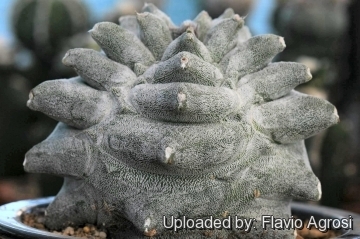 Description: Astrophytum coahuilense cv. 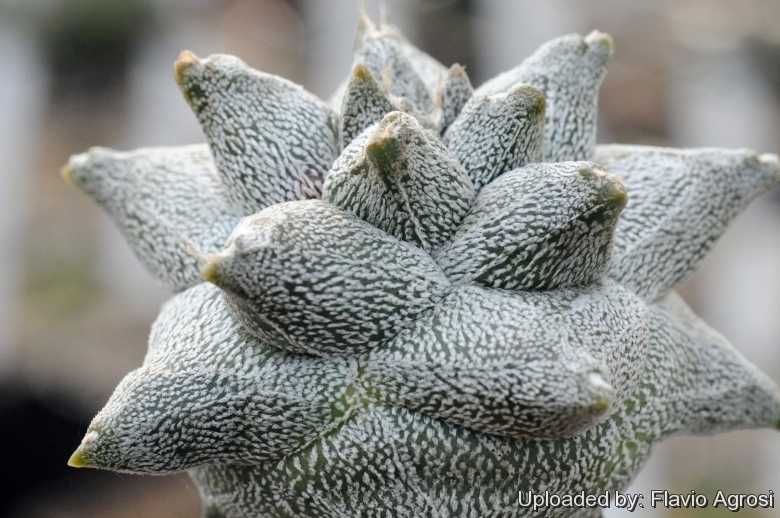 Hakuran (also known as Astrophytum coahuilense f. monstruosa or "kikko") is easily distinguishable for its ± wide and long pointed tubercles along the ribs edges. In general the bigger the "teeth" are and the longer and stiffer they are, the better. 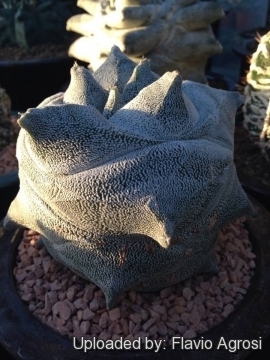 All species of Astrophytum (excluded Astrophytum caput-medusae) have their particular "kikko" variants. Stem: Pentagonal to almost spherical, dimension 10-15 cm tall, 5-10 cm in diameter. Ribs: Usually 5 (but sometime 3 or 4). Flowers: Like those of the well known Astrophytum coahulense yellow with a contrasting red throat. 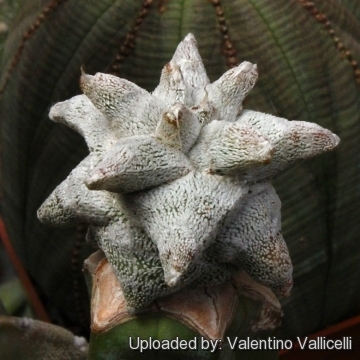 Astrophytum coahuilense (H.Moeller) K.Kayser: With five ribs it has a surprising similarity to Astrophytum myriostigma. 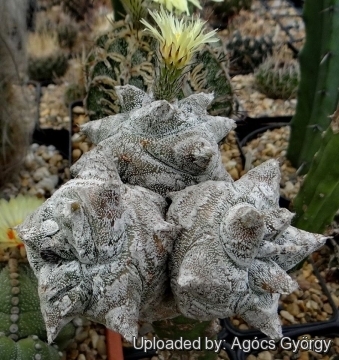 However, it is different in all characteristics regarding flower, fruit, seed and embryo which looks like in all details to Astrophytum capricorne. Astrophytum coahuilense f. tricostatum hort. : (cv. Sankaku Hakuranpo-gyoku) This is a nice cultivar with only three ribs with dense white flecks that cover the stem. 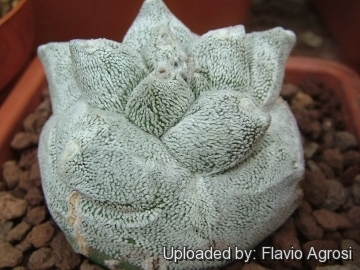 Astrophytum coahuilense cv. Hakuran: (cv. Kikkohakuranpogyoku) This cultivar is easily distinguishable for its more or less wide and long pointed tubercles along the ribs edges. Astrophytum coahuilense cv. Hakuran quadricostatum: Plant with only 4 ribs and long and pointed tubercles along the ribs edges. 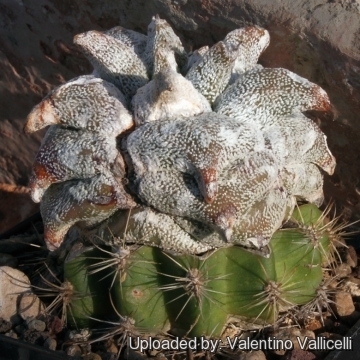 Astrophytum coahuilense cv. Little Flowers: Produces small elongated stems that branch profusely. The flowers are very small yellow. Cultivation and Propagation: Although regarded as a choice and difficult plant in cultivation it is relatively easy to grow. Growth rate: This cultivar is very slow growing and is often seen grafted onto columnar cacti to speed growth, but grows on its own roots too even if painfully slowly. It possible to increase the speed of growth to some extent by providing adequate amount of water and fertilizer. Soil: Use mineral well permeable substratum with little organic matter (peat, humus). Moisture: Water sparingly from March till October and keep perfectly dry in winter. Hardiness: Overwinter at temperatures from 5 to 15 degrees centigrade. (but it is Hardy to -5°C for short periods) In the rest period no high atmospheric humidity!! 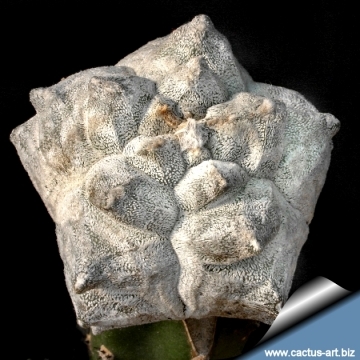 Propagation: By seed or usually grafted onto column-shaped cacti.